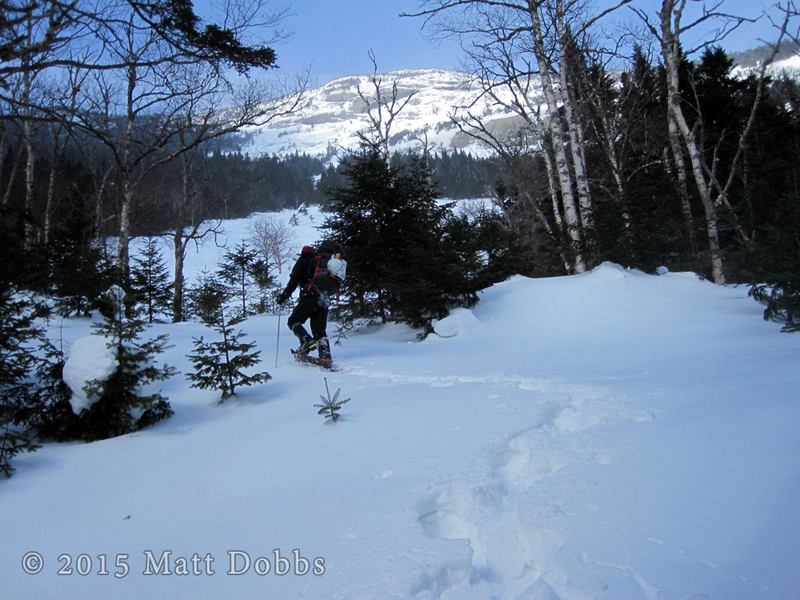 Though everything in the backcountry is alluring, a few places and features intrigue me more than others. Most of the upper Great Range holds a special place in my heart. While climbing Gothics via Pyramid in the early 2000’s I was taken by a stone sculpture, a cliff, on the far side of the cirque. The four tiers of the cliff were striped with moss, lichen, water and algae. I snapped several photos and looked at them every now and again. I thought it unfathomable to observe it more closely, however—go off-trail—heck no! That changed in 2011 when I climbed a portion of the East Face/Rainbow Slide for the first time. 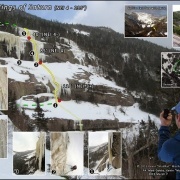 The lowest slab, perhaps 25-30 degrees in slope provided the perfect vantage point to study the feature. Being so close was humbling and I felt small and insignificant. 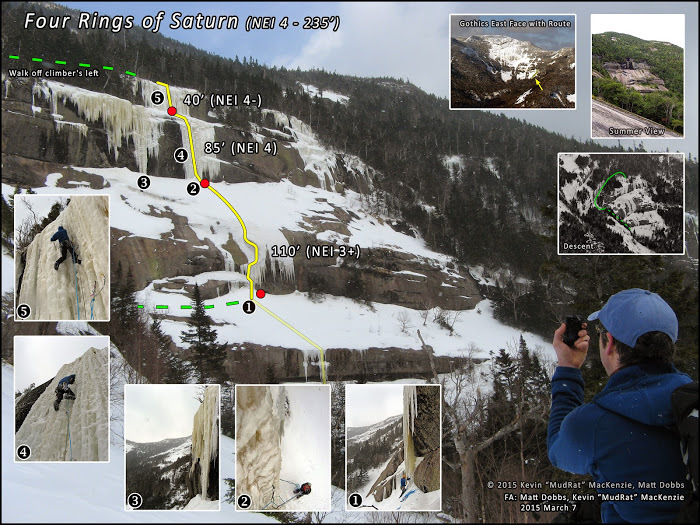 A view of them in 2012 again captured my attention during a winter ascent of the Rainbow Slide with Anthony Seidita. This time they were partially covered with a continuous, but delicate looking line of ice. 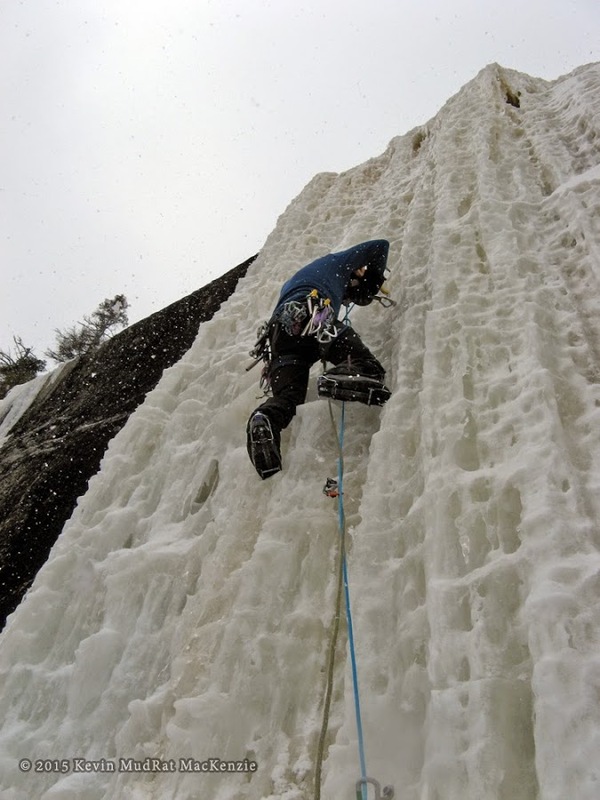 It never crossed my mind that they could be climbed—ice climbing was something that my cousin Ed Tuttle mastered, but one that I feared at the time. Over the summer of 2014, I studied the ice line repeatedly. A note began to resonate until it became a constant hum in the back of my mind. I thought, “What if…?” The thought turned into a dream that unfolded on March 7, 2015. I re-considered the recommended approach over Pyramid to the Pyramid/Gothics col. 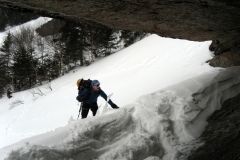 It served me well in the past with a supportive snowpack, but I couldn’t bear the thought of climbing Pyramid with a 45 pound winter climbing pack with rope, axes, protection etc. then descending-climbing-and re-climbing the cirque. I also knew that Cascade Brook hosted considerable storm damage. Thus I studied the terrain and plotted a direct line from 3,200 feet in elevation. The line left the Weld Trail just after the last stream crossing (about 10 feet wide) before the steep climb up to the Pyramid/Sawteeth col.
A heading of 345 degrees magnetic led up a gentle slope to the crest of Pyramid’s east ridge before moderately ascending to the bottom of the East Face. In all the bushwhack ascended a mere 400 vertical feet over ½ mile as opposed to the 1,200 foot gain to Pyramid. The refined approach would save about a mile in distance and 1,000 feet of elevation gain—or tank the day… To me, an adventure is all about exploring and trying new things—this seemed a worthy addition to a day with many variables. Partner Matt Dobbs picked me up at 6:00 a.m. Our trek began at 6:45 a.m. from the AMR trailhead. Our pace was steady yet comfortable on a well-packed trail and, at 9:20 a.m., we began the bushwhack along the proposed approach. Switching leads every 100 paces or so kept us fresh though it was a relief to finally reach more level ground atop the ridge. As a bonus, we could see our climb on opposing side of Gothics’ cirque through the trees—my heart quickened. I found myself enjoying the exertion as a way to burn off a growing anxiety about what we’d find at the route. Gentle side sloping defined the rest of the trek. We walked onto the lower slab of the East Face after only an hour and one-half’s bushwhack feeling refreshed and inspired. The semi supportive crust on the face was a change from the ice I’d found in previous years. Gothics’ summit loomed far overhead as snow flurries drifted across a pastel blue sky. I looked north across the face at our proposed line. I felt a pang of fear rise and wondered what I’d gotten myself this time. The upper tier looked ok; the bottom was thin and delaminating. A snowfield led to another smear of ice with a dubious looking curtain touching at the bottom. 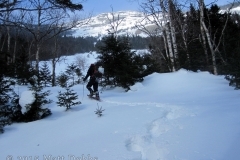 What was on the snowfield; was it snow over ice or would it be powder over smooth rock? The question concerned us both. 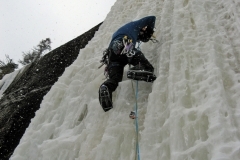 The third step sported a thick looking curtain of ice on an overhanging cliff. It touched down on the snow/ice slope below. We studied the lines and approached. Tier 1: I scooted up the snow slope and crept under the roof. Matt noted that it looked like an amazing bivy site; it was a very cool area. I tucked myself behind a meager patch of ice attached from above. I touched the back of it lightly with a foot and it detached with a crash. 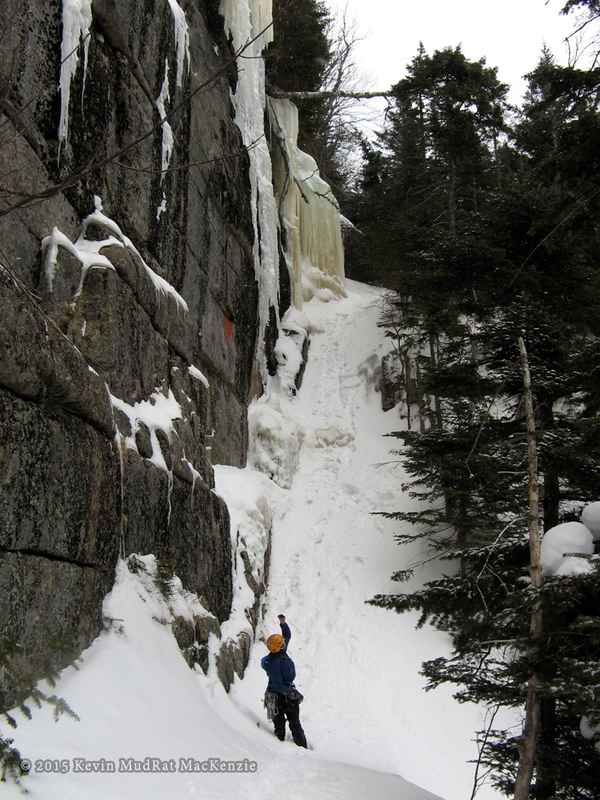 With good ice this would add another 10 vertical feet of ice and about 75 feet to the length of the route, but not this day. Tier 2: We climbed the snow slope on the left, stomped some platforms for the packs and changed gear. We traversed out to assess the thin ice column touching the base and contemplated what was above. There are enough cracks at the base that some cams up to about 2” would have been nice, but I set up a belay anchor from a nearby tree. The first 10 feet was vertical and good, if not a bit delicate. Another question was whether the smear would be thick enough for screws. 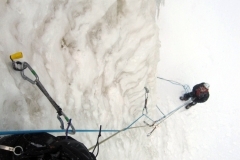 Matt climbed up and disappeared placing several ice screws along the way. Meanwhile, the snowfall got heavier and began to obscure the Ausable Valley. I could no longer hear Matt, only the sounds of the breeze and occasional pieces of ice falling from above. I felt the remoteness of the setting deep in my soul. This is what I sought—peace and solitude. Matt eventually yelled, “Anchored!” His voice sounded like it was coming far away from Pyramid, but it was merely echoing off the cliffs. I began the climb and realized this was the real deal—a notch far above my beloved slide climbing and harder than anything I’d previously attempted—not the normal place to test limits. 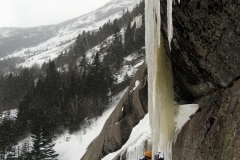 Ten feet of vertical ice led to a slight decline; my left foot hit the ice. It answered with a loud hollow thud. Safer ice was on the right side. 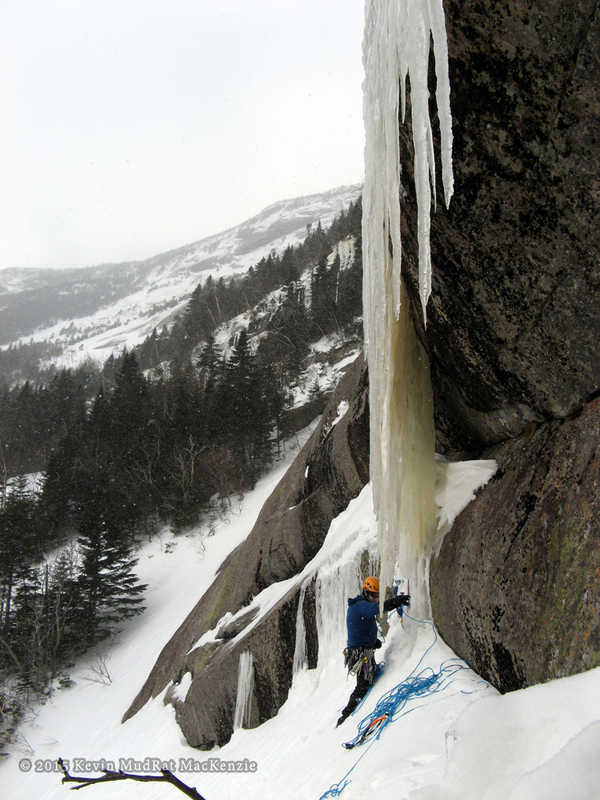 Tier 3: This was the crux ; a sustained wall of vertical ice some 50 feet tall. The curtain was rock hard and safe (I can hear some of you laughing at the oxymoron). Matt led it and disappeared above. The first 10 feet overhung slightly and made the vertical section seem comparatively comfortable to climb. By the time I’d removed the screws and climbed 40 or so feet, my arms were tired. Tier 4: The final 20 foot pitch passed quickly and I found Matt anchored in a grove of spruce. The route was done, but the trip was far from over. 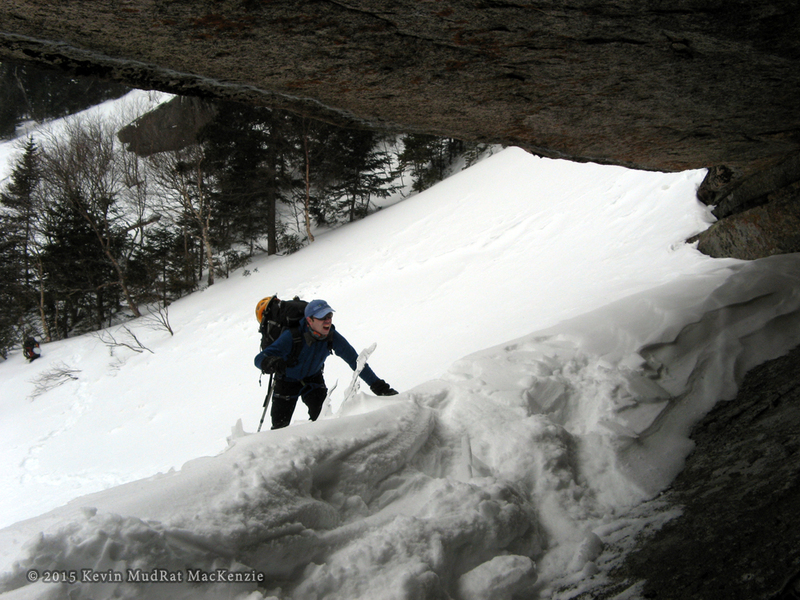 Exit: A short bushwhack through waist deep snow led to a cliff band and gully. 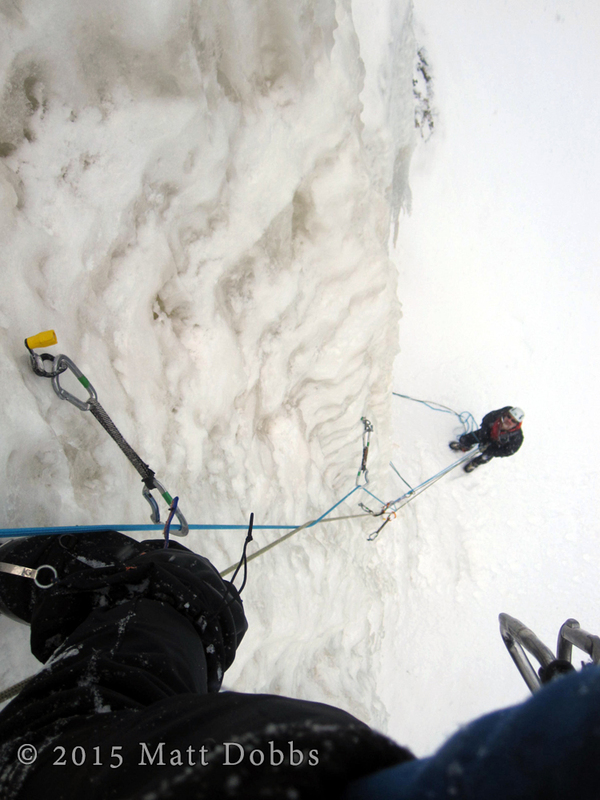 We easily down-climbed while hoping the huge daggers of ice above would stay attached while we passed below. 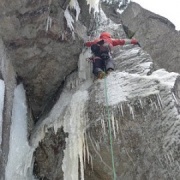 The gully was icy underneath the snow, but easy to downclimb. The cliff offered another good if not longer and harder climb for a future year. This too was an inspirational area, one that merits a future trip. Another climb down a gully to the left led to the base of our route. The time stood at 4:20 p.m. Duration: 12.5 hours; 6:15 a.m. – 6:45 p.m.
Benchmarks: Begin Bushwhack: 9:20 a.m., Rainbow Slide Base: 10:50 a.m., Route Base: 11:00 a.m., Done putting up route: 4:15 p.m., Weld Trail: 5:00 p.m.
Route: 13 miles/~3,600 feet elevation gain. 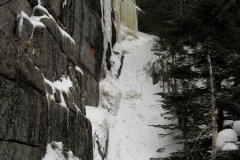 St. Huberts – Ausable Lakes via Lake Road – Alfred W. Weld Trail – 3,200 Feet elevation – bushwhack 1/2 mile at heading of 345 magnetic to East Face – Climb route – Exit along same route.